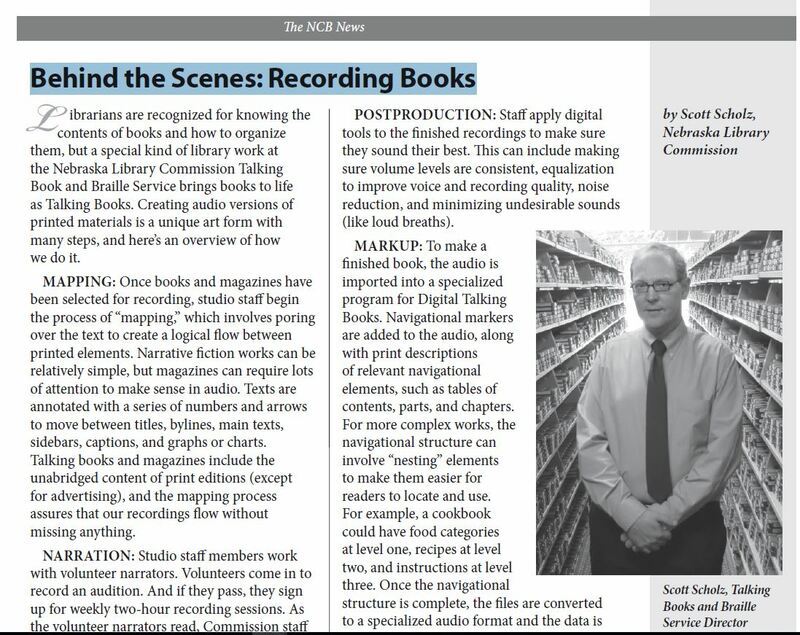 If you have ever wondered how a book becomes a talking book, you can find out in the most recent edition of the NCB News from the Nebraska Center for the Book. The Nebraska Library Commission’s Talking Book and Braille Service creates audio versions of print materials for the use of Nebraskans with a visual or physical condition or a reading disability that limits the use of regular print. 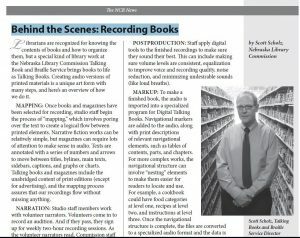 The activities of staff and volunteers throughout the process of mapping, narration, review, postproduction, markup, and duplication are described in an article in the Spring 2017 NCB News (page 9 at http://centerforthebook.nebraska.gov/docs/publications/NCBNewsSpring2017.pdf). For more information see http://nlc.nebraska.gov/tbbs/. To volunteer as a narrator, contact Annette Hall, Volunteer Services Coordinator, 402-471-4033, 800-742-7691, email. This entry was posted in Books & Reading, Talking Book & Braille Service (TBBS). Bookmark the permalink.